The hip pointer usually refers to a deep bruise of the iliac crest and the muscles that cover it, and is often caused by a direct blow. Hip pointers are most commonly associated with football but may be seen in any contact sports. 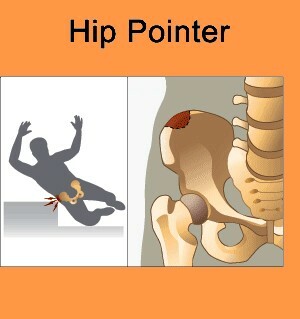 A hip pointer is usually a bruise of the muscle or bone, but can be as severe as a chip or fracture. The iliac crest (commonly referred to as the hip bone), felt when you rest your hands on your hips, is the bone involved, and the muscles that attach to the iliac crest include the hip flexors, the abdominals, and the muscles responsible for the rotation of the hips Because these muscles are injured at their attachments, any movement involving these muscles will be painful. Direct impact to the hip. Pain and tenderness over the iliac crest. Pain with movement of the hip, and sometimes with weight bearing (due to muscle involvement). Inflammation in the hip area. Left unattended, the pain and inflammation can lead to improper gait and become chronic. If the bone is chipped or fractured, failure to treat can lead to improper healing and future injuries to the site. Preventing hip pointers includes proper protective equipment during activities, and strengthening the supporting muscles around the hip for added padding and protection. Unfortunately there is not a lot that can be done to prevent falling or contact to the hip area. Rehabilitation includes rest until the pain subsides, then gradual reintroduction into the activity. Any activities causing pain should be discontinued until it is pain free. Hip pointers seldom cause long-term disablility and most athletes can return to full function after treatment and a rehabilitation period. Surgery is seldom required except in severe fracture cases. Call (+65) 6471 2674 (24 Hour) to book an appointment to see our doctor to check your hip today.